What a wonderful celebration of this grass! I love the fact that you forget about it and then have the fabulous ta-daa! I think missing out on the anticipation is a small price to pay. It's extremely windy tonight - I hope those wondrous plumes stay standing. Oh dear, strong winds forecast for today could be the death of said frothy plumes !! I've been thinking about snowdrops too. I've seen them in December before now. It'll be Spring before we know it. Not long now we are in the midst of the dark days, Jessica. Those snowdrops will be out before we know it. Thank we were in September." That is a poem to learn by heart and think of often in the depths of winter. I shall make that my task, and quote it to myself as I walk down the dreary, damp garden. It is so good to have something alive and fresh to enjoy in the garden at this time of year. It's pretty. I 'm not familiar with the pink variety, but I like it. I know what you mean about the last hurrah of the garden. Many plants are extra beautiful just before they fade. The pink ones are not very common at all. My roses are having a last hurrah too, and are, as you say, extra beautiful, before they stop blooming completely. 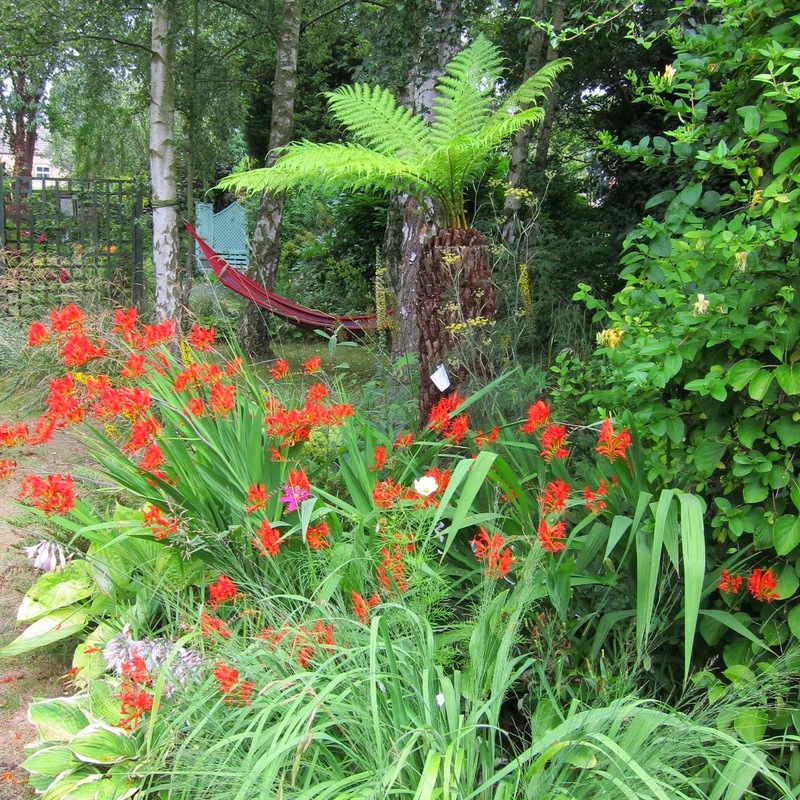 I used to have Pampas Grass but like many others ripped it out, the once ubiquitous is now little seen. The pink forms were available then but somehow didn't catch on because they seemed to share the bad reputation of the "common" plant. May be worth a second look? You have some lovely winter sunshine in your garden.I hope your plumes are still upright with all the wind that we've been having and more to come for the weekend I believe! 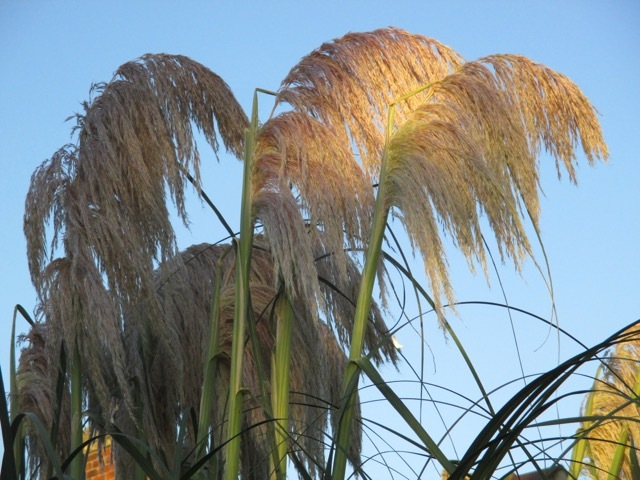 I have a stiff upright Pampas which contrasts with all the Miscanthus that sway in the wind. Yes it was lovely to see the sun, Pauline, however briefly ! We had very high winds last night and they are continuing today. 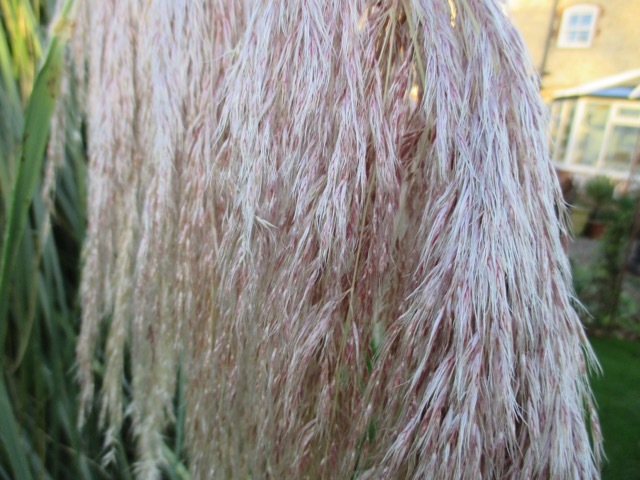 Weeping and pink, that is unusual for a pampas grass. Working in the garden today I could see the noses of snowdrops just peeping through. The snowdrops appearing marks the beginning of the end of winter in my book, whenever they appear ! That's an impressive grass. My parents grew pampas grass, though probably not the same variety--they grew it in South Texas. Your photos remind me of the mane of a shaggy horse trotting in the sunshine. I would think it grew well in South Texas ! I know what you mean about the mane of a shaggy horse ! Describes it exactly! 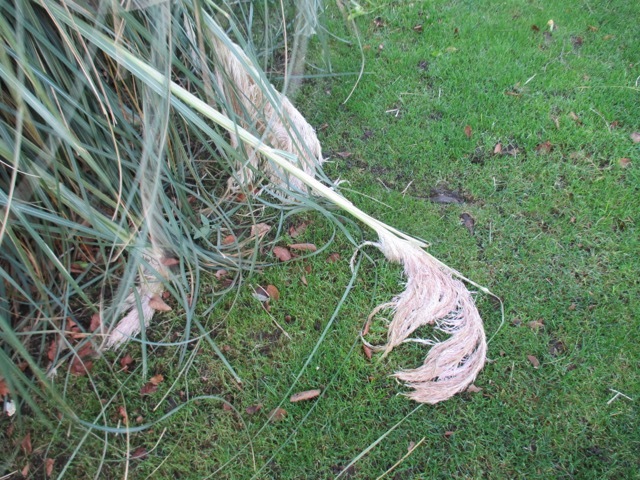 I haven' t seen Pampas grass like this before. What fun, they look just like Ostrich feathers. 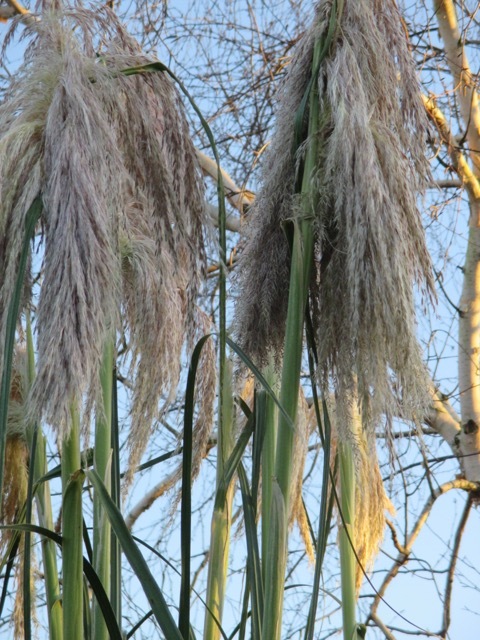 You could do an ostrich feather fan dance with them to celebrate the winter solstice. Yes Chloris, I could do a feather fan dance to celebrate the solstice, or , on the other hand, I could sit round a bonfire and have a couple of glasses of red!! How lovely to have this to look forward to each year. I think it really comes in to its own when the sky is blue and the plumes are picking up the sunshine. I do hope no more soldiers have fallen, it's blowing a gale here today. Hi Jo, I can't bear to look to see how many fallen soldiers are lying prone on the grass after the wind! It was howling down the chimney last night in a very scary way! Hi Anna, the leaves are absolutely lethal ! So sharp! I quickly learned not to handle them without thick leather gloves! Your mum was very sensible! We used to have a pink one but it outgrew us and the leaves were blade sharp so it had to go. I bet it took some digging out Sue! They get so big so quickly! Have you had any damage from Desmond ? It did put up quite a good fight, Jane. Desmond has managed to break our bird feeder again, but as for the plot we haven't been down there for over a fortnight so I'm not sure what will have happened there. He certainly blew up a song and dance around us. Desmond howled down our chimney and shook the trees but did no real damage, thank goodness. Hi David. Thanks for new email address. It is a very weird season, as it is so mild, up here as well as with you, much further south. How are your lemon trees ? Staggering along. I grew two from pips in the dark warm cupboard next to the AGa. Scratched the surface and left them on wet cotton wool. More stark was the Wisteria pips which I planted. I was unaware that wisteria pods explode and send their seeds some 20 feet in all directions. I have propagated so many. I have never tried propagating either before . It is a wonderful feeling when they begin to germinate! Hmmm, what to do with a large family of Wisteria babies ... you may have to consider adoption!! 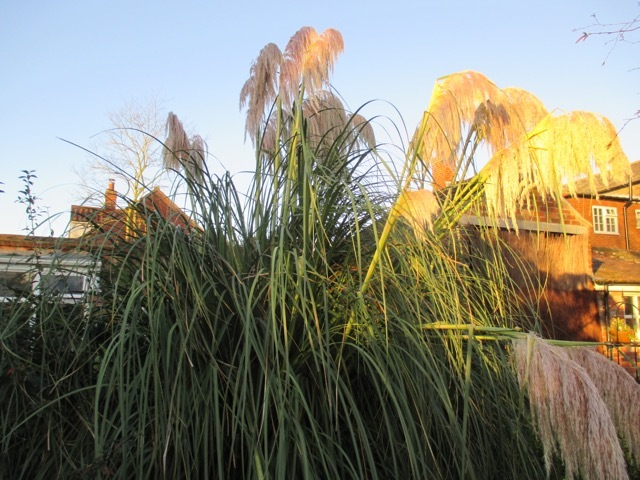 Pampas Grass is amazingly tall, so I can imagine how striking the pinkish plumes must be in the December light. It must be nice to have snowdrops on the near horizon. Here we are bracing for the onset of a long winter. Oddly enough though the weather today is freakily mild. Hopefully we will get snow for Christmas. Happy holidays to you! It is weirdly mild here too, and we are making the most of it ! No gloves or hat needed which is rare in December!! happy holidays to you too Jennifer! 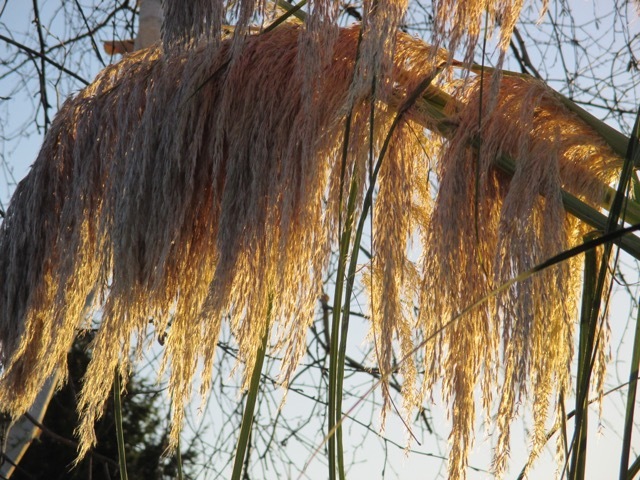 Dear Jane, your Pampas Grass is indeed gorgeous! Up to now I didn't even know that there are different varieties out there, but I can see why you prefer yours over the more common variety. 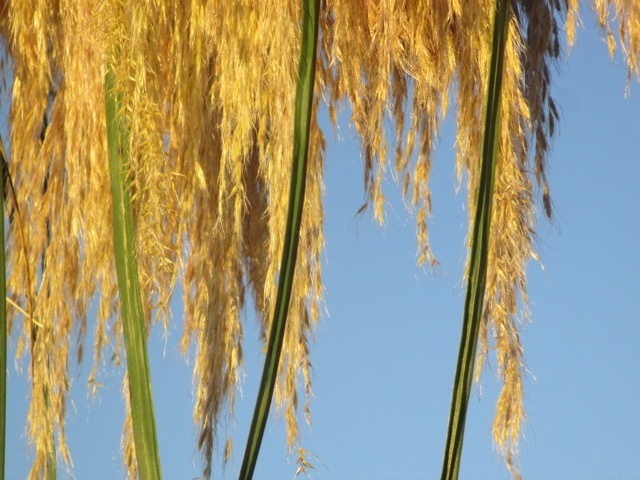 I have to admit I like the common variety too and Pampas Grass does relatively well here in Southern California, but unfortunately it is invasive. Since our property is bordering on to an open space area, I decided not to plant it, to avoid that it reseeds itself into the natural areas.